The Twelve Dogs of Christmas, by Kevin Whitlark, is a lovely take on ‘The Twelve Days of Christmas’, with each day being represented by a different breed of dog doing the things dogs love to do! 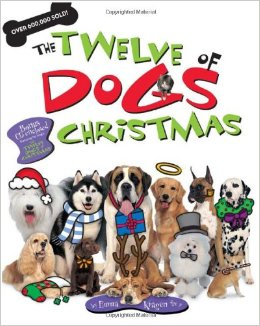 Sing ‘The Twelve Days of Christmas’ or ‘The Twelve Dogs of Christmas’ – you could even make up your own version of the songs about another animal…what would ‘The Twelve Cats of Christmas’ sound like? There is a movie of this name that has some nice reviews that you might like to explore – let us know if you think it’s worth a watch! Practice counting while reading this book with a younger child. Talk about the similarities and differences between different dog breeds and sort them out according to their characteristics.